Northern California fire coverage for The Wall Street Journal — Portraits, Corporate Storytelling, and Reportage Photography based in Washington, D.C.
Last week, I was called by The Wall Street Journal to shoot video and still photographs of the aftermath of the historic wildfire in Sonoma and Mendocino counties in northern California. The devastation was unlike anything I had ever witnessed. My assignments allowed me to interact with the Monroes, whose family property in Redwood Valley, California was completely destroyed. You can read the harrowing story here. Fire aftermath in the Coffey Park neighborhood Oct. 12, 2017 in Santa Rosa, CA. Cal Fire officials survey the damage of a devastating fire in the Coffey Park neighborhood Oct. 13, 2017 in Santa Rosa, CA. Fire aftermath in the Coffey Park neighborhood Oct. 13, 2017 in Santa Rosa, CA. Eli Monroe, center, stands by his car he used to barely escape the Mendocino-area wildfire on his family's property Oct. 15, 2017 in Redwood Valley, CA. Jan Hoyman's property destroyed by wildfire in a secluded neighborhood off Tomki Road Oct. 15, 2017 in Redwood Valley, CA. Firemen search for hotspots on Jan Hoyman's property destroyed by wildfire in a secluded neighborhood off Tomki Road Oct. 15, 2017 in Redwood Valley, CA. The Monroe family property destroyed by wildfire in a secluded neighborhood off Tomki Road Oct. 15, 2017 in Redwood Valley, CA. Firemen leave the Redwood Empire Fairgrounds Oct. 15, 2017 in Ukiah, CA. The fairgrounds were used as a staging area for fire officials. 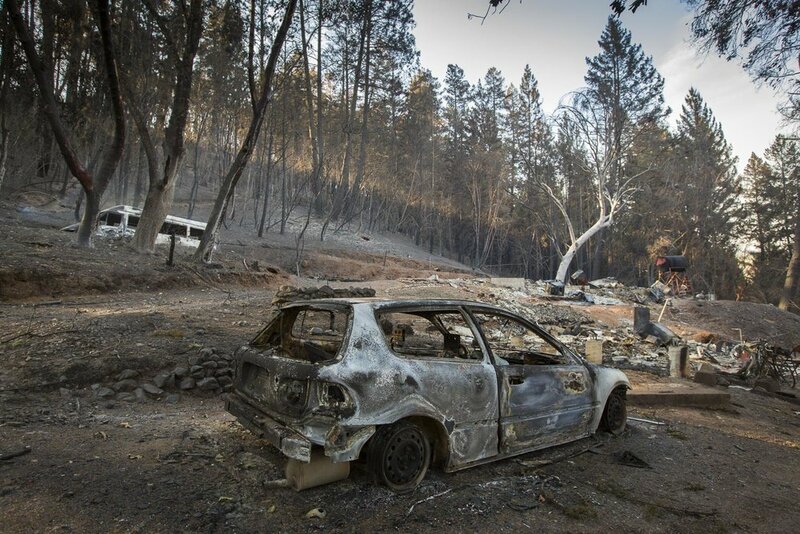 A burned car sits on the road to the Monroe family property, destroyed by wildfire in a secluded neighborhood off Tomki Road Oct. 15, 2017 in Redwood Valley, CA.